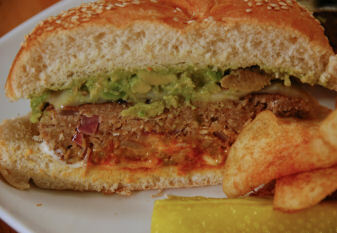 The other day, the foodie decided to dig through some of my vegetarian cookbooks for veggie burger recipes. After perusing a few he asked me “TVP or Walnut Oatmeal?” Although I do often really like the way textured vegetable protein works in recipes, walnut oatmeal just sounded too good to turn down. I hadn’t tried either recipe before, because despite my many recipe books, I really have never been much of a cook. After a quick trip to the store for a few needed ingredients, the burger assembly began. When he got to the browning of the patties, I was amazed at how meaty the burgers smelled. The house filled up with their irresistible aroma and I couldn’t wait to try them. I was definitely not disappointed when they were complete with these very flavorful burger and their nice meaty texture. They were nutty and delicious and the best veggie burgers I’ve had the pleasure to eat, which is saying quite a lot considering the many many varieties of veggie burgers I’ve eaten in the past. I hope to see this recipe again soon. The leftover mixture got to make a second appearance as surprisingly convincing meatballs in a spaghetti and meatball dish a few days later. 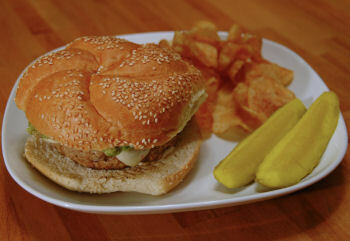 Grind walnuts in blender and combine with the rest of the burger mixture ingredients. Let the mixture rest in refrigerator for about an hour to let the flavors meld together. Form the mixture into patties. The entire mixture will make 8-12 burgers depending on the size patty formed. It is recommended to use half of the mixture now, and reserve the rest for use in another recipe or for more burgers later. Brown patties on both sides in a lightly oiled skillet, then pour the stock into the skillet and bring to a boil. Reduce heat and simmer, covered, for 25 minutes. Serve on buns with all your burger fixings. 1st attempt today and they totally fell apart in the simmering stage. From reading the comments, I think I know where I went wrong. I wanted to veganize them so I used Ener-G egg replacer and I used soy milk to sub for the skim. The patties browned nicely, and were edible but needed softening. Anyhow, the simmering staged turned my patties into porridge. I added TVP crumbles to soak up the extra liquid and then I baked the entire dish for a veggie meatloaf. The flavors are really good. Next time I will let make sure that I use more egg replacer to bind the mixture better and let it sit in the fridge. I will post again after my 2nd attempt. I’ve made similar, though without the use of milk. They are absolutely fantastic. They make equally good meatballs, if you’re looking for alternative uses of the mix. I know plenty of omnivores who can’t believe they don’t contain meat – which I think tells us more about the state of the processed meat industry than anything else.